Each warning track material is selected for its combination of structural support and appearance. 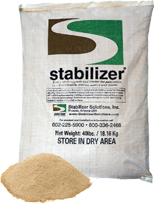 These materials go through a stringent crushing and screening process resulting in a good balance of sand, silt, and clay. New options available provide you with unprecedented choice over color and surface feel (fine or coarse). Every option is available mechanically blended with Stabilizer water binding technology.